The NFL appears to be digging in and preparing for a war with President Donald Trump. During a rally in Alabama on Friday, President Donald Trump criticized NFL players who protest the national anthem, saying he wished NFL owners would "fire" the players and say "Get that son of a b---- off the field right now." On Saturday, several NFL teams released official statements condemning the comments, backing their players, and seemingly prepping for a drawn-out social media battle with Trump. NFL commissioner Roger Goodell responded first, saying Trump's comments showed an "unfortunate lack of respect for the NFL." 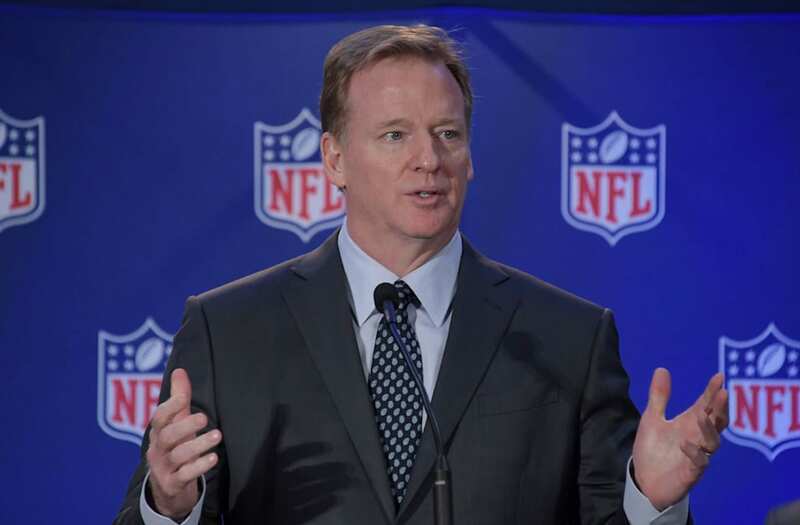 A short while later, several NFL teams followed suit with strong statements, several of which came directly from the owner of the team. Here is just a sampling of the statements from NFL teams. From San Francisco 49ers CEO Jed York: "The callous and offensive comments made by the President are contradictory to what this great country stands for. Our players have exercised their rights as United States citizens in order to spark conversation and action to address social injustice. We will continue to support them in their peaceful pursuit of positive change in our country and around the world." From Atlanta Falcons owner Arthur Blank: "We are at our very best when we are working together, building unity and including everyone's voice in a constructive dialogue. Creating division or demonizing viewpoints that are different than our own accomplishes nothing positive and undermines our collective ability to achieve the ideals of our democracy." From Miami Dolphins owner Stephen Ross: "Our country needs unifying leadership right now, not more divisiveness. We need to seek to understand each other and have civil discourse instead of condemnation and sound bites. I know our players who kneeled for the anthem and these are smart young men of character who want to make our world a better place for everyone. They wanted to start a conversation and are making a difference in our community, including working with law enforcement to bring people together. We all can benefit from learning, listening and respecting each other." From Indianapolis Colts owner Jim Irsay: "“I am troubled by the President’s recent comments about our league and our players. Sports in America have the unique ability to bring people from all walks of life and from different points of view together to work toward or root for a common goal, and the Indianapolis Colts are proud to be a part of that tradition in our home city and state." From Green Bay Packers President and CEO Mark Murphy: "It's unfortunate that the President decided to use his immense platform to make divisive and offensive statements about our players and the NFL. We strongly believe that players are leaders in our communities and positive influences. They have achieved their positions through tremendous work and dedication and should be celebrated for their success and positive impact. We believe it is important to support any of our players who choose to peacefully express themselves with the hope of change for good. As Americans, we are fortunate to be able to speak openly and freely." In addition, several players have spoken out, including Richard Sherman of the Seattle Seahawks who called the president's behavior "unacceptable."